DATE Middle Elamite, circa 2500 B.C. Elamite, Middle Elamite, circa 2500 B.C. 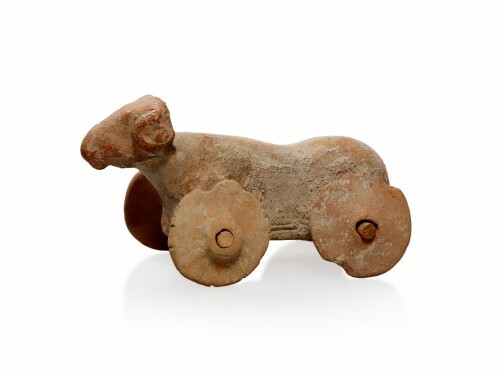 Pinkish terra cotta toy, depicting a Mouflon in cylindrical form with circular horns and raised bulging eyes, the body with incised markings to indicate the anatomy of the animal, the wheel axles pass through pierced holes in the flanges under the front and rear of the body, the circular wheels are held by two modern cylindrical wood sticks. A pattern of tool marks on the underside. Please note: This item may not be shipped into the USA due to US Iranian Transaction Regulations. Formerly in a Connecticut private collection, 1980s. Some minor chips as shown on images, the wheels attached with after-the-antique wood pegs, in overall great condition. cf. The Royal City of Susa; Ancient Near East Treasures in the Louvre, p. 196, no. 139.